Club Penguin Cheats by Mimo777 Club Penguin Cheats by Mimo777: Club Penguin Island Adventure Party Sneak Peek! Club Penguin island will soon be full of adventures for mermaids, pirates, and castaways at the first ever Island Adventure Party! Looks like battle ships to me! Sweet! I hope we can have a hamburger fight! What are you looking forward to at this new party? its probobly the "members only room" or the snow forts. Awesome! This is gonna be SAWEET!! Also, what if this is a new game! this is so cool I hope rockhopper is going to be their! haha hamburgers would be awesome!! What if the other ship is rockhoppers enemy?! no need to diss cp for making a member only room. Members kinda deserve it because they pay for a membership so in a way they do deserve it. I cant wait for the new party to come out Thursday! I am all ready to go! I am excited to see the member room too. yeah!! awesome a pirate ship batlle, maybe rockhopper will fight against us! !1 that would be cool1!!! Last years party was fun and I hope you have a good time this year and dont miss this one! Well is wasnt putting Cp down it was just stating a point. But in a way it could be considered offesive. Good imagination! It would put a good twist on the party if Cp developed some type of enemy for Rockhopper! a hot dog fight would work better cause they're shaped like bullets so they would have more of an impact if you through them properly. Last years was pretty awesome so im sure this year will be more awesomer! That wouldn't be very good, espically since were calling Rockhopper over here! So if the ship is Rockhopper's enemy and we're calling him over here it's like were calling him just so he could meet his enemy! Maybe we could help by shooting carrots at eachother. Waddle On! There was anothetr adventure party mimo, it was last year. Just trying to point out. Yep. Club Penguin does it all in thanks for becoming members for them! I think. Lol. Waddle On! Haha, hamburgers? What about cheeseburgers? And some cannons will shoot french fries! Aha. Any updates on the Caqption Contest? maybeee but that will be awesome!!! maybe herbet?? Hey, Mimo can have an opinion too! If your sibling did something bad to you, Mimo might think it's okay! You never know! I am looking forward to searching for rockhopper and looking forward to getting free items. that's definetely the snow forts. every decorative theme they change the forts ito a battlefield. Here's a tip, when Rockhopper comes don't use any trackers. I have never found an penguin using them. hay mimo in the cp times if you hover over aunt arctics face they look like spy glasses how cool does this mean that she could be the directer? Ah, I remember when I met rockhopper. I was searching on Mammoth. (a server he is usually on. I went to the Captain's Quarter and said "I GIVE UP!" But then I noticed a huge crowd. But who be in the crowd? Rockhopper! Rockhopper better bring a new item this year and it better be a ITEM! I don't like those backgrounds! They're pretty boring. I finnaly got my membership back today! :) now when the ship battle comes out i can go on it. It's so funny when you meet him!hope you do! Actually, second. We are the Penguins of the Carribean! I think it's the members only room! The members only room IS a battleship! That would be SO cool! The whole party's gonna rock, don't you think? I think you access it from the Cove. It's a members room! I hope he mainly hangs out there! This is so awesome! Let's use ice cream! Hehe, that would hurt. 'Specially the cones. Who dissed CP? That was me, righttttt... Just kidding! Lol. But it's true, they gotta make money! You're right, but there's so much in members only rooms! I think they should have less! It's gonna be so insane! I can't wait either! Not even chicken can make me patient! I can so see that. "Ahh!! Brace for... wait... are those.. HOT DOGS?!" Lol! I forgot about the caption contest, lol! French fries! Maybe ice cream too! That'd ROCK! We might get the elite red puffle! I really hope he has something GOOD, unlike last time! But every time he comes it's fun! cool! Maybe rockhopper will be in there! :D And last year adventure i only join in the last day and tmr , its gone... that time i didnt do anything.. :( sad but now im looking forward to it!! why are you not a member mimo777? "OF COURSE they have something planned for the members"
Lol, we wouldn't want that to happen! Guess what? He is! It was announced in the newspaper! Me too! I love looking for Rockhopper. I normally go from server to server looking for him. Good luck finding him! Yea it does look like Pirates of the Caribbean doesn't it? But instead of cannon balls we'll probably be shooting eachother with snow balls. Waddle On! It might be. But I think it's a member room. Lets stuff the cannons with tomatoes instead of cannon balls! Waddle On! Me too! Think the flares are going high enough for him to see? Let me check. *climbs in basket of flares* Wait robotic arm! Im not a flare! *shoots* AHH! We're already sinking Scamper, Friend says. Oh, that was too easy for Rockhopper..., I say. Twinkys could work too! Oh wait, the're too soft... Nevermind. *mumbles to self* Wow, brilliant one Scamper! I WANT A TACO CANNON!! Better make sure they arn't TOO interactive. That robo dragon they had for the midieval party burnt my flipper! I wasn't expecting it to breath fire! Good thing I keep mimi snowball shooters in my messenger bag. Take that dragon! If we're all pirates who will be the vikings? And um, i've never mistook Yarr for a cannon ball... Stop looking at me! What makes you think well get a hamburger fight? Was there an Adventure party last year???!! When?? 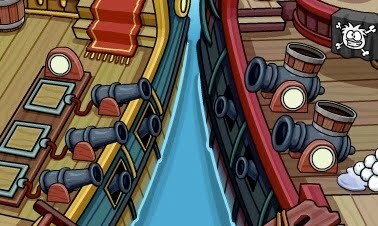 it looks like rockhopper's boat on the right and another boat on the left. Hey! Just becuase there's a member room (or two) doesn't mean you can diss CP! Like Missypoo99 said! They only do that because they need money to keep their site running, and what better way to make members flow in CP by making member only rooms, to encoiurage members to join. cool.mimo i need some advice. i was banned for 24 hours but when i had to log on to my friends acount it was messed up and didnt exist. so when i checked on my penguin i was banned forever. How do i get my 24 hour ban back? Oh, vikings and pirates? Coool, can't wait for this par-taay! Do you think Rockhopper will get on the island in time for the party? Awwwh! I hope yar won't be in the cannon too! Never trust Vikings! Hello we are going 2 have a fight in rockhoppers ship or maybe we are going tto fight with him,well club penguin has a lot of surprises for this adventure party so...PARTY!! (. "Don't type "first comment" So pointless." ??! Breaking the rule! wweee oohhh (siren noise) police are after you! Don't worry dude i'll help be a pirate. PS: And If Yarr gets shot out of a cannon then my puffle will too. I think so too. When is the party gonna be? mimo wheres the new mission? wow this is awesome i think ive never went to one but my penguins 400 and something days old so ive been here almost 2 years oh and its gonna rock what if we could shoot hamburgers and tomatoes awesome oh and im a girl but my name is a band cause my profile was my brothers. Thats would be cool if we could shoot hamburgers and tomatoes. My penguin is 1046 days old. I have been around Cp for 3 oor more years now! I am suprised my penguin hasnt grown a beard! Yea somethings supposed to come out today. I havn't seen it yet. Keep your eyes out. Cool. I wouldn't mine getting squirted with soda! Unless it hit me in the eyes. That would hurt. Eh, I could imagine it now. My eyyees! Hmm. Don't want that happining. Waddle On! Yea. Maybe later today. We'll have to keep looking. We ain't sure yet. We're still waiting. Hopefully it will come later today. Keep watching. I don't know whats going on. Maybe Gary and the Director are sleeping... Shh... Wake up guys!!! We're supposed to report for duty today!!! Oh, I don't think that worked. Keep looking out for it though. Lots and lots O suprises. I for one don't know if I would want to fight Rockhopper. The ship would probably be sinking before we knew it. But we can fight back with... Mailboxes! Air Mail! O, umm. I would email costumer service about a problem like that. Maybe they will know what to do. Good luck. Maybe there imposter ships! Maybe there really... Ghost ships. Ahh! Whats that!? It's just me, Friend says. Oh, um, I think im going to go watch TV at home. Lol. Yea, I visit Mimo's sight everyday. I love meeting Rockhopper. His hat's really big. Lol. Yea there was an adventure party last year. It was all planty like. The plants got stuffed in the Box Dimension for a while. Then they dissapeared when the orange puffle started floating around in it. Maybe the orange puffles ate all the plants! Or maybe they just took them out to prepare for the party. Mostly all penguins like fish. Weird. Your not really Herbert are you? Hmm, na. You look like a penguin. And yea the new EPF thing was supposed to come today. Keep watching out for it. And good luck finding Rockhopper. I always go from server to server looking for him. He's fun to find. What about a chicken cannon? Chickens are fluffy and big enough to stick in cannons and best of all they will make funny sounds when you shoot them! Lol. Well, last year it was just Adventure Party. This year it's Island Adventure Party. But yea I still don't know what the big difference is. I guess we'll find out at the party. Mimo is a member. He became a member I think cause of all the member rooms lately. You can see his member badge from the post of what the code in the EPF game unlocked. He also got a six month membership from Billybob not too long ago. At the mine there is a sculpture of herbert with weeds on it. I noticed the sculpture too! Do you think herbert left a bomb in it and it's going to make club penguin explode?! I think that might happen...! its so battle ships awesome!! and i noticed the statue herbert made in herberts revenge and it looks like its been there for a while,i wonder wut rh is going to bring.